The TRIO comes with a cutting bit (I call it a scroll bit) and a sanding mandrel with three grit sanding drums (60, 120 and 240 grit). Plus, a wrench for loosening and tightening the collet. A regular baseplate and a compact foot baseplate are also included. Below is the anatomy of the TRIO to help familiarize you with the tool. There is a speed adjustment on the handle of the tool. Typically you would leave it on 10 – 12 for cutting wood. A lower speed may be necessary when cutting plastic to avoid melting the material. raise the handle and use it with a vertical grip. Changing bits is fairly simple but requires two hands (my photo is not 100% accurate). One finger pushes the button on the front of the TRIO to lock the collet. The other hand uses the wrench to loosen the collet. Be forewarned that you CANNOT use bits for a regular dremel in the TRIO. The shafts are different sizes. Thanks for this. I need to go back and look at the other tool posts. This looks like a tool that I could use for my art. But I still have a Dremel tool in the box that I need to get out and try. Trying is key. Failing might happen. And then laughter, right? Thanks so much for posting these tutorials! I have a lot of wood working tools that I inherited from my dad’s shop. I have no idea how to use some of them! Your sight is great! Love the labeled pics and directions! 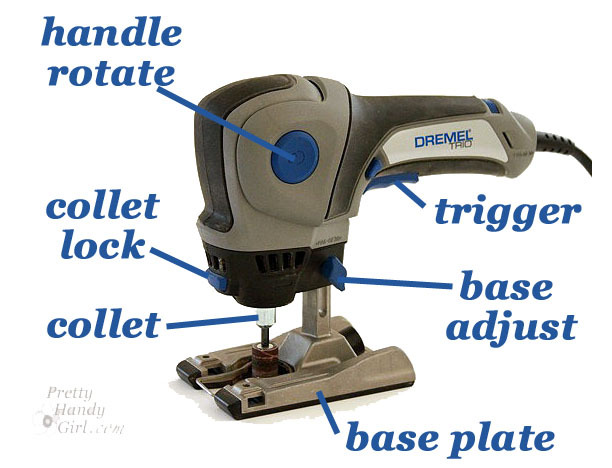 Interesting, but don’t know if I’d use it or not since we already have two of the regular dremel tools. I did enjoy your tutorial though…it’s always interesting to see how something works. I really thought the indoor photography idea was great. I make jewelry and just can’t get a good picture of them. And I’ve tried everything. Your hint about reflecting helped alot. Thanks so much. Also all the prizes are wonderful, but it’s a toss up between the sharpies (my granddaughters would love you) and the dye. So much could be done with both. Thanks again for your blog. I am new to your blog and so far I am loving it. I would love to win a prize, any would work for me. I have this tool…have had it a while and now I have some guidance towards how I can use it. Thanks for this information. so I could interchange it with other dremel accessories.